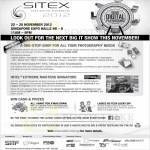 Please note: SITEX 2012 has ENDED hence the image(s) offers may no longer be valid. For the latest IT Fair event, visit the homepage. 8 General Information SITEX 2012 price lists, brochures and flyer images. Latest image was added on 12 Dec 2012 13:44hrs. 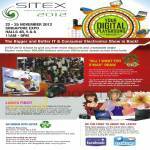 Are you an exhibitor at SITEX 2012? Contact us ( or itfa...@itfairsg.com ) to submit your offers, promotions and news for FREE.